"Clayton saw we needed to win the series and came with the usual intensity and intent," manager Dave Roberts said. "Clayton was Clayton. For us to get that win was not only good for him, but for us." "Looking for something in I could pull, and he gave it to me," Van Slyke said. "Big league pitchers are good, and you come back and, like, wow, you got to adjust yourself. I know I can hit any lefty if I'm focused and have my swing down." This Day in Dodgers History:In 1958 Don Newcombe is traded by the Dodgers to Cincinnati. In 1963 rookie Nick Willhite became the first pitcher in LA Dodgers history to throw a shutout in his Major League debut. He defeated the Cubs, 2-0. It would be 29 years before another rookie would do the same - Pedro Astacio. 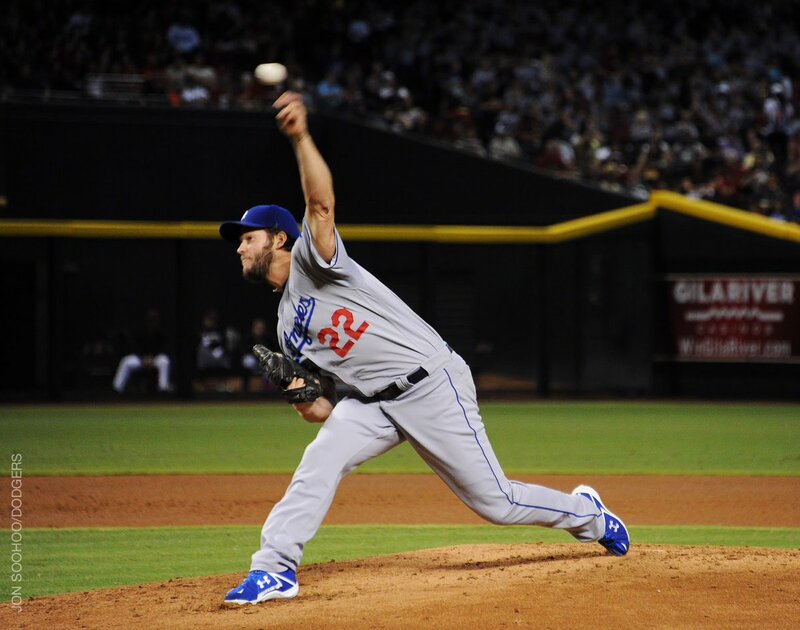 Via Eric Stephen at True Blue LA; "Kenley Jansen ties Eric Gagne's all-time Dodgers saves record." Via Ken Gurnick at MLB.com; "Maeda improving after right leg injury." "Better. Swelling down, weight bearing, so again, we're encouraged he'll be able to make his next start," Roberts said. "It just got him in the best possible spot. There are bones to both sides of where it hit, but it got him in the muscle and not the bone, where it got [Andre] Ethier." The Dodgers 6th Round pick during the recent 2016 Draft, Errol Robinson, has just signed a contract with the team, per his Instagram. errol_robinson6 Officially signed with the Los Angeles Dodgers! Blessed to have the opportunity to live this dream I've had since 4 years old! Thankful to all of the people that made this day possible. Go @dodgers! According to Josh Norris of Baseball America, Robinson signed for $250,000. BTW, it has also been reported that the Dodgers second round pick Mitchell White has also signed for $590,800; via Chad Thornburg at MLB.com. Also, 22nd round pick Jeff Paschke (per his Instagram) and 20th round pick Brock Carpenter (per his Instagram) have also signed. This is terrible news. Chad Billingsley might be done with Baseball. Via Bruce Hefflinger at the Crescent-News; "Chad Billingsley: 'I'm fine if I've thrown my last pitch'"
Rest is the only hope at getting back to where he once was. “I talked to the doctors at the end of last season and they said don’t do anything for seven months,” Billingsley explained. “They said don’t stress it. The seven-month time frame has arrived, but the rest continues. No other remedy is in sight. “The elbow can’t stand when I throw with intensity, where I want to be,” Billingsley said. Via Nicholas J. Cotsonika at NHL.com; "Howe family stays welcoming during hard time: Open their arms to thousands of fans, media members, dignitaries at services for 'Mr. Hockey'"
Gordie Howe was not just "Mr. Hockey." He was Dad and he was PeePaw. He was a husband to one, a father of four, a grandfather of nine and a great-grandfather of five. If you've lost a loved one you know how difficult it can be, how much you want to close in and shut out the world. But the family understood what Gordie Howe meant to the world and why. He was beloved not just because he was a great hockey player, one of the greatest who ever lived if not the greatest. He was beloved because as nasty as he was on the ice, he was kind, open and welcoming off the ice. And so the family was open and welcoming at the hardest of times.